President Mugabe was yesterday elected First Deputy Chair of the African Union, rendering futile a decision by the European Union not to invite him to a summit of the two blocs slated for Belgium in April.The AU Executive Council was firm in that Europe should not be allowed to dictate to African Heads of State and Government who will attend the summit. The resolution will be tabled for adoption at today’s 22nd Ordinary Session of the AU General Assembly. President Mugabe’s election to the post, to which he was seconded by Southern Africa, positions him to assume the AU chairmanship next year. The President also chaired an Extraordinary Sadc Summit here that lifted regional sanctions imposed on Madagascar following a 2009 coup in that country. The Head of State and Government and Commander-in-Chief of the Zimbabwe Defence Forces is the current SADC Deputy Chair and will chair the regional bloc from next year’s summit. Announcing the composition of the five-member Bureau of the Assembly of Heads of State and Government, outgoing AU chair Prime Minister Hailemariam Dessalegn of Ethiopia said Mauritania landed the top post and would be deputised by Zimbabwe (first deputy chair); the DRC (second deputy) and Nigeria (third deputy). DRC also assumed the responsibility of rapporteur. The bureau is the AU’s supreme organ, tasked with steering the agenda of the continental grouping. Each of Africa’s five regions seconds a member to the bureau in line with the AU constitution. Foreign Affairs Minister Simbarashe Mumbengegwi said membership of the bureau signified Africa’s strong support for Zimbabwe. “It is the growth of confidence in Zimbabwe. Secondly, the First Vice Chair normally becomes the Chair of the African Union. So, chairmanship of the AU will come from Southern Africa next year, meaning Zimbabwe is in the running. “This is particularly important in the sense that, as you know, there is the AU-EU Summit in April this year. The EU had decided, and I would be surprised if they maintained the position, that President Mugabe should not be invited to the summit. “Two regions have spoken. Now, how could one say they do not want the First AU Vice Chair to be at the summit? That would be ridiculous; it would be absurd! It means the EU decision has gone up in smoke. “In fact, the (AU) Executive Council has taken a decision, which will be tabled for adoption, that the European Union can only determine the EU delegation and has no right to dictate to Africa which Heads of State and Government should attend. 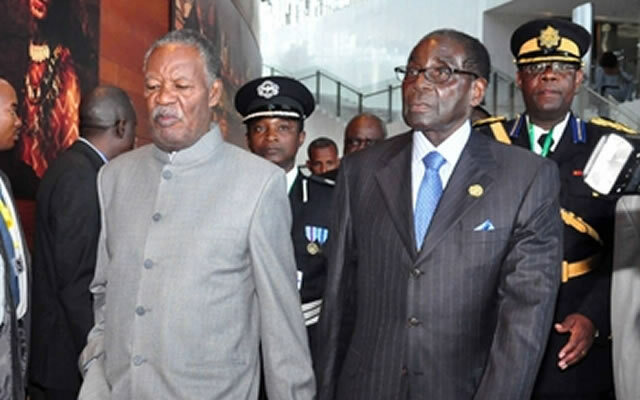 Turning to the Extraordinary SADC Summit, Minister Mumbengegwi said President Mugabe led the gathering as the Chair, President Joyce Banda of Malawi, was absent. He said the summit resolved to lift sanctions on Madagascar and also received a report on the subsequent elections and inauguration of President Hery Rajaonarimampianina this month. “Sadc met under President Mugabe and decided to lift the sanctions. We were also briefed on the eastern part of the DRC since the defeat of the M23 rebels. The situation is stabilising. The government has done well, working together with the Sadc force. President Mugabe attended a lunch meeting where leaders interfaced with young people from different parts of the continent who highlighted areas governments should refine to meet the needs of the youth. Key points of concern were education and employment. President Mugabe highlighted the role of parents, governments, communities and other stakeholders in educating children. He said youths could contribute to development once critical education aspects such as entrepreneurial skills and psychomotor development were embraced. At the official opening, newly-elected AU chairperson President Mohamed Ould Abdel Aziz of Mauritania said there was need to support agriculture as a chief economic driver. He said social protection programmes should be expanded to benefit more people, adding that promoting agricultural value addition and investment were imperatives. “Preserving the environment and ensuring that food security no longer represent only a legitimate aspiration for our countries, but constitute compelling objectives due to the current food crisis and negative impacts of climate change. Also addressing delegates in the main plenary hall, which was yesterday named Nelson Mandela Hall in honour of the former South African President who died last year, Ethiopia’s Mr Dessalegn said more countries were meeting targets set under CAADP. One of these targets is for AU members to allocate 10 percent of their national budgets to agriculture. Zimbabwe has exceeded the threshold since CAADP’s adoption in 2003, except during the tenure of the inclusive Government. “This is the time to celebrate the progress made over the past decade in implementing goals and objectives set by CAADP and renew our commitment to do more in the coming years and decades,” said Mr Dessalegn. The session ends today with leaders expected to emerge with resolutions on agriculture and food security; peace and security; the status of fragile states; AU-International Criminal Court relations; a draft position on the Post-2015 Development Agenda; and the new vision to guide Africa over the next 50 years.